ASAKI, GORO “GEORGE”, 94, died peacefully in his sleep of natural causes on October 31, 2018 in Ellicott City, MD. 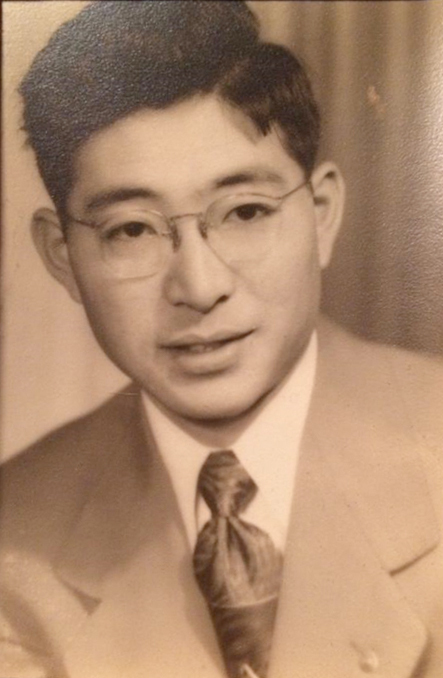 Born on December 25, 1923 in Hanford, CA he was one of thirteen children of Japanese immigrant parents, Masuji and Mine Asaki. He was predeceased by his parents and by siblings Shichiro “Tom” Asaki, Teruko “May” Ishimoto, Teiko, Nobuko, Fumiko “Fumi” Inada, and Hiroshi. He is survived by siblings Aiko Imagawa, Kiyoko “Koko” Wittenburg, Yoshiko “Yo” Seltzer, Isamu “Sam” Asaki, Yutaka “Jack/Skip” Asaki, and Sei “Stephen” Asaki. He and his family were relocated to a Japanese internment camp in Jerome, AR after the outbreak of WWII. He later enlisted in the US Army in 1944 and sharpened his existing Japanese language skills at the Military Intelligence Language School at Ft Snelling, MN. Although he was qualified to be an officer, he was restricted to the rank of Technician 3rd Grade because of his Japanese ancestry. As an Interpreter, he was assigned to a unit of the Military Intelligence Service (MIS) and was awarded the Congressional Gold Medal among other awards. He earned a BS in Electrical Engineering from the University of Illinois, and became a certified Professional Engineer. He worked for Westinghouse in Baltimore for over 30 years until he retired. Goro married Nobu “Nobie” Sekiguchi of Seattle in 1950 in Chicago. They and their children, Arthur, Howard and Esther, lived in the Baltimore and Annapolis area. Eventually they had grandchildren, Sarah Yukiko, Rebecca, Andrew, Samuel, and Miriam. Goro was an amateur ‘ham’ radio operator (W3MPN) making contact with other ‘hams’ in every foreign country except one, and was instrumental in forming a chapter of the Quarter Century Wireless Association. He was a member of the Japanese American Citizens League, and the Cub and Boy Scouts. Goro was a longtime member and one-time president of the Lake Shore Rotary Club. From the mid 1960’s to late 1980’s he was active in public school education. After president of two school PTAs, he served as president of county and (MD) state Boards of Education. He was later appointed to the (MD) Governor’s Task Force on AIDS in 1987 regarding fairness and safety of students at school during an early, scary period of the epidemic. Although he was 94 his mind was sharp to the end. His last act of service was to donate his body to the Uniformed Services University of Health Sciences for education and research. Goro was well-liked and took his family on educational outings and vacations. He picnicked with his extended family, and for relaxation he liked to go fishing, though sometimes without a hook.